The recent Golden Spike Weekend was an unqualified success, as the Clarke Museum, in association with Eureka Main Street and the Timber Heritage Association, celebrated the 100th Anniversary of the driving of the Golden Spike at Cain Rock. On Thursday night, the Golden Spike Dinner went off without a hitch, as nearly 100 celebrants dressed in period attire gathered at the Eagle House for a fine 1914-style four course dinner catered by Gallagher’s. Before dinner, attendees were addressed by John Williams, the current President of the Northwestern Pacific Railroad. 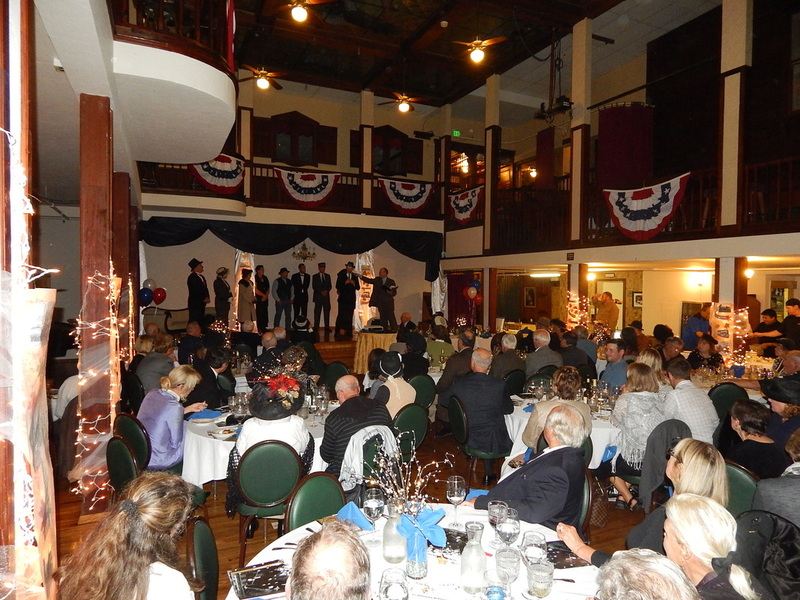 Following the enthusiastic speech, guests were entertained by a comic reenactment of the driving of the spike featuring guests of honor Humboldt County Supervisors Ryan Sundberg, Virginia Bass, and Rex Bohn, Eureka Mayor Frank Jäger and Eureka City Councilmembers Chet Albin, Marian Brady and Mike Newman. The enjoyable scene was narrated by master of ceremonies Eddie Olson of Murder By Dessert. Shortly afterward, the 1914 silent film Driving the Golden Spike played while dinner was served. Event-themed Rusty Nail and Golden Spike cocktails were mixed and served to eager celebrants throughout the evening by Clarke employees and volunteers. The evening concluded with a pair of delightful performances by several Master of Fine Arts candidates from Dell ‘Arte International: Chris Kehoe, Alyssa Huglett, Moses Norton and Cooper Smith. The Clarke Museum would like to thank all attendees and sponsors who helped make the Golden Spike Dinner a success. To those who missed the fun, don’t worry. Our 4th Annual Murder Mystery is coming up on February 7, 2015, be sure not to miss it! This event was sponsored by Black Lightning Motorcycle Café, Carol and Gerry Hale, The Chalet House of Omelettes, Coast Central Credit Union, Dell 'Arte International, Don's Rent-All, GHD, Heritage Antiques & Coins, Holly Yashi, Humboldt Growing Solutions, Lost Coast Communications, Mad River Brewing Company, North Valley Bank, O & M Industries, Pierson Building Center, Pride Enterprises Tours, Renner Petroleum, Shafer's Ace Hardware, Slack Family LLC, Lisa Slack, Rick Slack, Times Printing Company, THCA, Umpqua Bank, United Rentals, Wendy Wahlund & Ben Shepherd, Lonnie Wellman, and Wes Green Landscape Materials. The Golden Spike Weekend chugged on Friday evening with the public unveiling of the Golden Spike Exhibit. The grand opening included a one-time only viewing of the original Golden Spike, which is normally locked securely inside a safety deposit box. 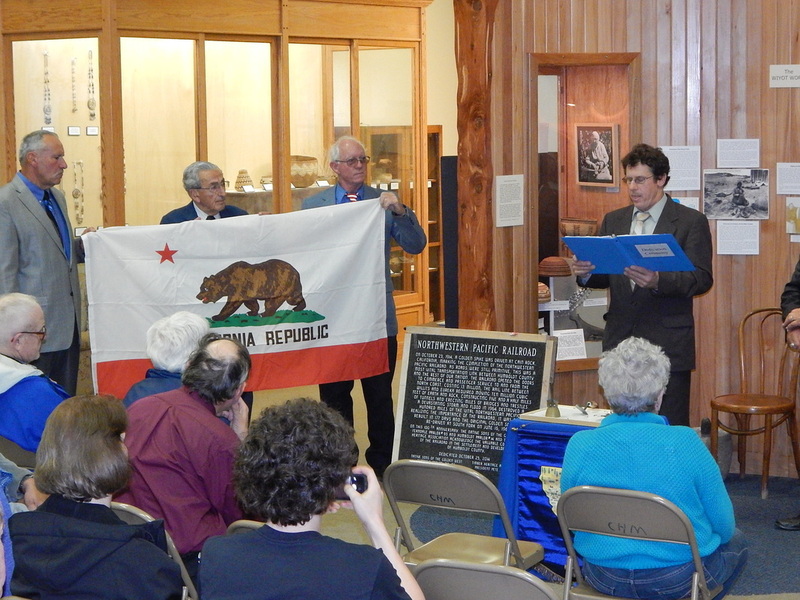 Afterward, the Native Sons of the Golden West honored the Clarke Museum with the dedication of a special plaque commemorating the centennial of the Northwestern Pacific rail line, followed by a presentation by Dr. Alex Service and Susan J.O. O'Hara showcasing their new book: Northwestern Pacific Railroad: From Eureka to Willits. The fun continued on Saturday, as the Timber Heritage Association displayed the old Elk River Mill and Lumber Company’s #1 Falk locomotive in front of the museum. The THA also ran speeder cars through Old Town throughout the course of the day, giving excited riders a chance to feel the rails under their feet one more time. Though intermittent rains forced the street fair inside, the Golden Spike celebration went on! Refreshments were served to the sounds of the Redwood Dixie Gators, who played in Nealis Hall during the event.